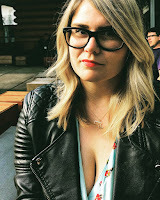 One time, when I first met Matt, I was like "He's a total douche bag." And that was without talking to him. I just based these thoughts on the people he was associated with... and probably his hair. Then I was like, "He wears a lot of graphic t-shirts..." and then I ultimately realized he was actually not a douche bag, but the total opposite. He's actually kind of a nerd, and super nice. He's not all hair. Matt and I decided to start an improv troupe with our friends Dave Boz and Chris Carpenter. We did house teams together and we had a lot of fun together, so we thought we'd start an outside troupe called Slow Clap. Oh, Slow Clap... we did things. We rehearsed at churches, we had funny moments in shows, we even ate Friday's chicken fingers together. The first thing I did was crack up. 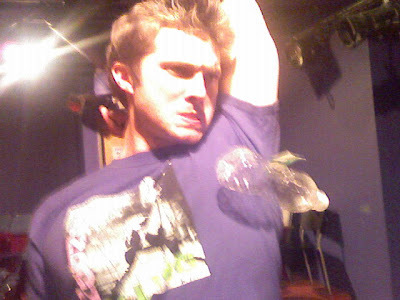 Then I thought of the time he was holding his water bottle under his armpit, then when he lifted his arm, it was stuck. I ALSO thought Matt Cat had douchebag hair when we first met!